You are never too old to learn piano! This course is designed for beginners and will cover the basics of the instrument and music fundamentals. It is natural for adults to feel uncomfortable at the keyboard because of stiffness in their fingers or wrists. 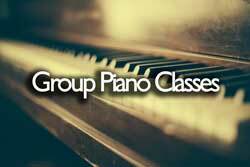 Therefore, in this class students will learn how to sit with the proper posture at the piano, and how to maintain the correct hand position without tension. Moreover, by the end of the course students will play for each other during class and learn how to have fun sharing music with others. Group lessons are a natural stepping stone to private piano lessons with HBSM's world-class piano instructor, Dr. Ekaterina Bessmeltseva. At the end of the course the students will develop a basic music reading and sight-reading ability, learn music theory concepts, and gain an overall appreciation of the music. Students will play for each other! It is expected that students practice at home by themselves for approximately 30 minutes per week. Willard A. Palmer, Morton Manus, Amanda Vick Lethco : Adult All-In-One Course, Level 1. Class 1: Welcome, posture at the piano, hand position, musical Alphabet, introduction to the staff, C position, introduction the the rhythm. Class 2: The Grand Staff, Time Signature, Introduction to the intervals. Class 3: Introduction to the chords. Class 4: Articulation in music. Class 5: G Position, Intervals in G position. Class 6: The Sharp Sign, New Chords, The Damper Pedal. Class 7: New Songs: Beautiful Brown Eyes and Apline Melody. What’s the Right Instrument for My Child?